Ivan Jacobo’s career is really cooking. 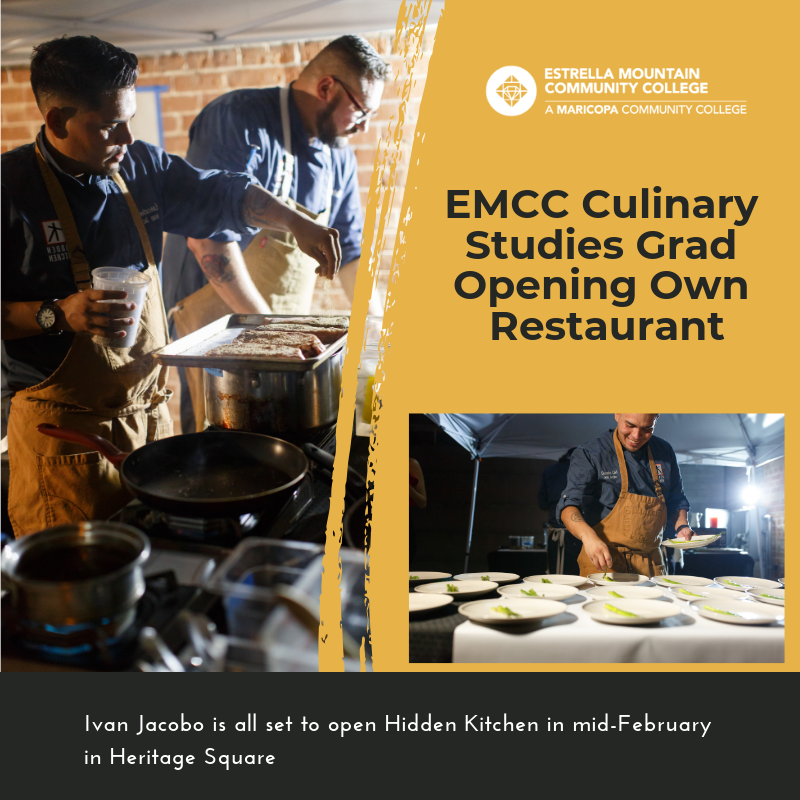 The Estrella Mountain Community College (EMCC) Culinary Studies graduate has already tasted success from his Hidden Kitchen catering and pop-up dinners venture, and now he’s set to simmer in one of the hottest areas in Phoenix: Heritage Square. The 27-year-old is taking over the space formerly occupied by Rose & Crown Pub on the northwest corner of Seventh and Adams streets. Jacobo’s hoping to have his liquor license in time for a soft opening Feb. 7-9 and then open to the public Feb. 11 or 12. He’s been renovating and making repairs to the building since finding out last October that he was chosen out of a pool of 22 applicants to take over the city-owned lease. He was the youngest applicant, as well as the only applicant without any prior restaurant ownership experience. The menu will be contemporary American. “The way I’m explaining it to people is it’s a contemporary American restaurant featuring dishes to spark up conversations, meaning every dish is something that you’re familiar with, but presented in a different way where you basically have to go, ‘wow, what is that?’” Jacobo said. Sparking conversations, especially among strangers, is what Jacobo has strived for since he first launched Hidden Kitchen pop-up dinners nearly three years ago. Through social media, he invited people who didn’t know each other to a dinner in which the menu and location (until the day of the dinner anyway) were a mystery. He said he fell in love with the pop-up dinner concept because all the restaurants he’d worked in had one thing in common: he always saw people on their phones. The pop-up dinner idea solidified after he was invited as the head chef to a charity dinner for the Leukemia & Lymphoma Society where every seat was auctioned off. It didn’t take long for pop-up dinner diners to tell their friends and Jacobo’s email list began to grow. Cooking was just one ingredient to the secret of Jacobo’s success. Paying attention to his guests’ likes and dislikes was a staple, he said, explaining that he trained his servers to take notes on his guests’ lives in general, as well as their food tastes and allergy restrictions. “So you’re pretty much guaranteed to never have the same thing twice,” he said. Combine those ingredients with a generous helping of volunteerism and voila: a wildly popular business had risen. Griffiths said Jacobo is driven and willing to go above and beyond. But Jacobo wasn’t the only one to go above and beyond. “I remember we did a class on pulling sugar and I told Chef Griffiths that I really wanted to learn how to do more and he took the time and basically gave me an hour of his time, showed me how to go more into detail, so he definitely played a huge role in my education,” Jacobo said. With the opening of Hidden Kitchen comes Jacobo’s opportunity to play a role in other culinary students’ success stories. Not only is he planning on offering a six-month paid internship to an EMCC Culinary Studies student, but he’s also planning on giving a first-year scholarship to another. The thing that started it all won’t go away simply because Jacobo is opening his own restaurant. Instead, he’ll incorporate pop-up dinners into the brick-and-mortar business, he said, explaining a table for 20 will be booked every day at the Heritage Square location. The only difference is that the location won’t be a surprise. But the guests and the menu still will be. To learn more about Hidden Kitchen, visit www.hiddenkitchenrestaurant.com.